Theater in the Now: Review: Who Was That Masked Man? Review: Who Was That Masked Man? 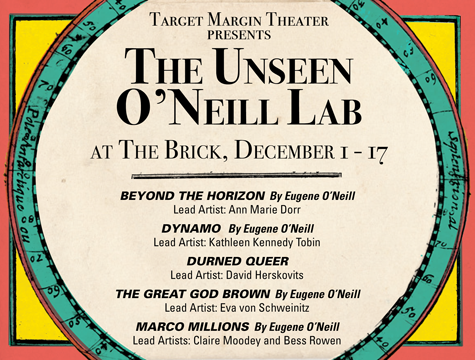 Target Margin has begun their twenty-fifth season with The Unseen O’Neill Lab at The Brick. Indeed, several rarely produced plays have been performed, and I had the chance to see a unique, beautiful take on The Great God Brown, a 1926 play which appeared between some of the author’s more classic, sprawling theatrical feasts. Replete with gender-crossed casting, jumpsuits, hardware for props and orange plastic safety fence for set, this play delivered on its promised mythical references. Eva von Schweinitz was the Lead Artist for this production. Dion Anthony (Nicolas Noreña) and Billy Brown (Javan Nelson) are friends, sons of business partners in an architectural firm and also in love with the same woman, Margaret (J Molière). The latter is the only natural woman in the cast, as some of the other female roles, such as the all-wise prostitute Cybel are portrayed by Alessandro Magania. Dion, who eventually succeeds in wedding Margaret and having three children, devises a ferocious, primal mask. He explains that the mask was necessary for him to channel the chaos of The Great God Pan to overcome his gentle friend The Great God Brown. Have you noticed the classical symbolism? Dion (read: Dionysus or Bacchus) treads into the ecstatic part of human potential, but ironically he drinks himself to death. As he is dying, Dion asks Billy to take his mask, take his place and live with his wife. Previously, Billy had been seen with the prostitute Cybel (read: the ancient mother goddess) but now finds the courage and new energy to dominate his business and to seduce Margaret. There is much poetry spoken, such as Dion’s dying rant: “William Brown's soul lies moldering in the crib but his body goes marching on!” Remarkably, Margaret briefly notices the change in her partner’s voice but never asks him to remove his mask and so never notices he is a different man. And so some of us live our lives, the superficial masks of others our main focus. The strain of being both partners in his firm and a dominant husband is too much for Billy, who eventually dies next to Cybel. Like Adonis or Tammuz or some other would-be hero of old, he returns to the mother goddess, except said goddess is a man in this production. Target Margin’s aesthetic works very well in The Brick. The two and a half hours of the play flew by. Abby Felder’s masks really make this production. Made of interesting devices, found objects and glowing lights, the central mask harnessed the bewildering, tribal aspects of consumerism (perhaps more relevant than some remote forces of nature found in myth). There was also a transparent, smiling mask worn by Billy Brown the businessman. The forced happiness of this mask was quite eerie. Dan Daly’s scenic design was appropriate to a story about architects on the verge of madness. Daniel Taylor Matthews’s costumes ranged from starkly functional outfits which characters could quickly change to play multiple roles, to gender-defying attire for Cybel and the mothers and children in the cast to Margaret’s gorgeous dress. Phillip Gerson’s sound design included elegant old dance numbers and poignant, more contemporary songs of desolate longing.